We keep hearing about the "October Effect" - it even has a definition at investopedia.com.au. October 2018 has clearly been a shocker for equity markets. The S&P/ASX 200 Index is down 6.5% and the indices covering smaller Australian stocks are down at least 10%. Earlier this year we pulled together five years of weekly price data for the S&P/ASX Small Industrials Index and reviewed the week-by-week average performances. So we've returned to that data to have a look at how this index performed in Octobers past. We counted a week as belonging to a month if its last trading day was in that month - so the week ended September 1, 2017, was grouped in September even though it started in August. Apparently, Confucius didn’t say “One Picture Worth Ten Thousand Words” after all. It was an advertisement in a 1920s trade journal for the use of images in advertisements on the sides of streetcars. Even without the credibility of Confucius behind it, we think this saying has merit. Each month we share a few charts or images we consider noteworthy. As investors in listed companies we often highlight the importance of alignment - we want executives and boards to have bought into the ordinary shares of their company just like we have. The data shows - as highlighted in Equitable Investors' "Seeking Advantage" paper (you can read it here) - that listed companies with executives that own a material shareholding perform better than other companies. So it only seems logical that investors in funds and other investment scheme structures would like to know that the fund managers, similarly, have committed capital alongside the investors. Nothing in this blog constitutes investment advice - or advice in any other field. Neither the information, commentary or any opinion contained in this blog constitutes a solicitation or offer by Equitable Investors Pty Ltd (Equitable Investors) or its affiliates to buy or sell any securities or other financial instruments. Nor shall any such security be offered or sold to any person in any jurisdiction in which such offer, solicitation, purchase, or sale would be unlawful under the securities laws of such jurisdiction. The content of this blog should not be relied upon in making investment decisions.Any decisions based on information contained on this blog are the sole responsibility of the visitor. In exchange for using this blog, the visitor agree to indemnify Equitable Investors and hold Equitable Investors, its officers, directors, employees, affiliates, agents, licensors and suppliers harmless against any and all claims, losses, liability, costs and expenses (including but not limited to legal fees) arising from your use of this blog, from your violation of these Terms or from any decisions that the visitor makes based on such information. This blog is for information purposes only and is not intended to be relied upon as a forecast, research or investment advice. The information on this blog does not constitute a recommendation, offer or solicitation to buy or sell any securities or to adopt any investment strategy. Although this material is based upon information that Equitable Investors considers reliable and endeavours to keep current, Equitable Investors does not assure that this material is accurate, current or complete, and it should not be relied upon as such. Any opinions expressed on this blog may change as subsequent conditions vary. 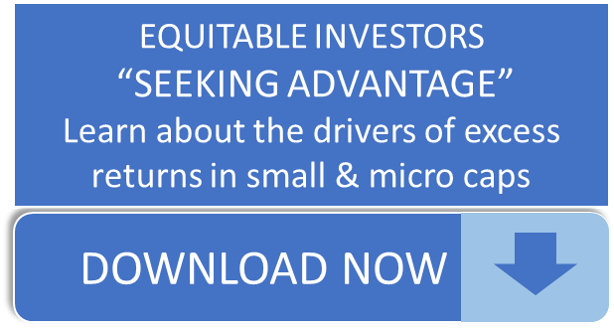 Equitable Investors does not warrant, either expressly or implied, the accuracy or completeness of the information, text, graphics, links or other items contained on this blog and does not warrant that the functions contained in this blog will be uninterrupted or error-free, that defects will be corrected, or that the blog will be free of viruses or other harmful components.Equitable Investors expressly disclaims all liability for errors and omissions in the materials on this blog and for the use or interpretation by others of information contained on the blog.